One of the easiest ways to use our services for your blog, hosted on Blogger, is using our Records Templates. They allow you to create the necessary records in your Master DNS Zone, when you decide to use your own domain for your blog in Blogger. If you haven't registered your own domain, you can do it by clicking here. On this page, you can choose your TLD and to register it through ClouDNS. In your ClouDNS account, you need to create a Master DNS Zone. If you do not know how to do it, you can check it here. When you are ready with creating your Master DNS Zone, go to your DNS Zone Control Panel and find the "Records Templates" button, located between "SOA settings" and "Cloud domains" buttons. Click on it. From the orange boxes, click on "Blogger". As you can see, the records are ready for creation, but first you need to find the "Short token" and "Long token" codes. The tokens verify that you are the owner of this blog. To find the tokens, go to your Blogger account. There, click on "Settings" and Find "Publishing". Click on "+Set up third party URL for your blog". There, enter your domain name. Note that the blogs may not be hosted at naked domains (ex: yourdomain.com). You need to add a top-level domain (www.yourdomain.com) or subdomain (blog.yourdomain.com). This is valid also for the "Host" field in our Records Templates. 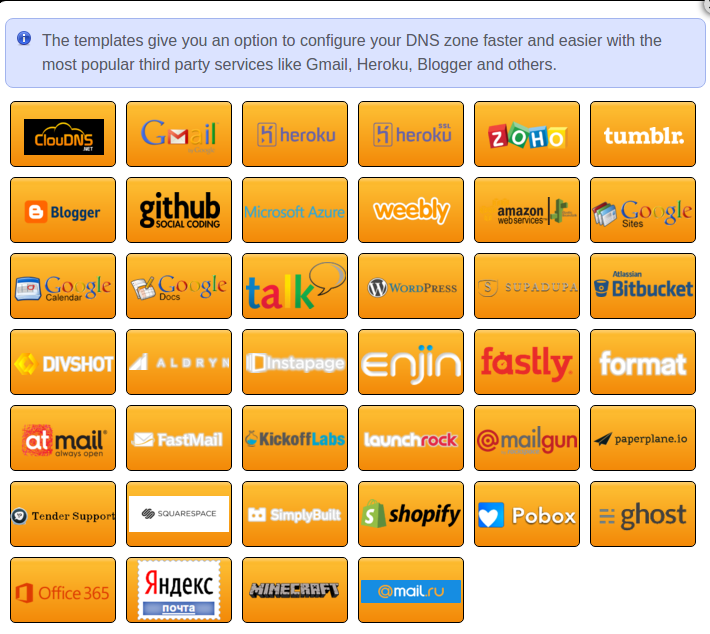 When you click on the "Save" button, you will find the two tokens you need for your DNS zone. They are shown in this screenshot. The first one is the short token and the second one is the long token. The tokens at the screenshot are just examples. 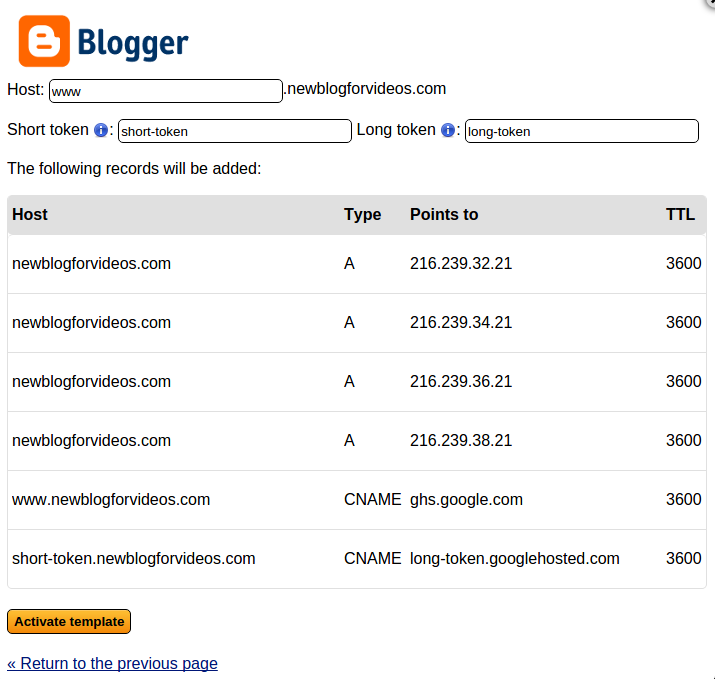 Copy the tokens and paste them in the white fields in your Blogger Records Templates. Then, activate the template by clicking on the orange "Activate template" button. In Blogger, Click on the orange "Save" button. You are ready! 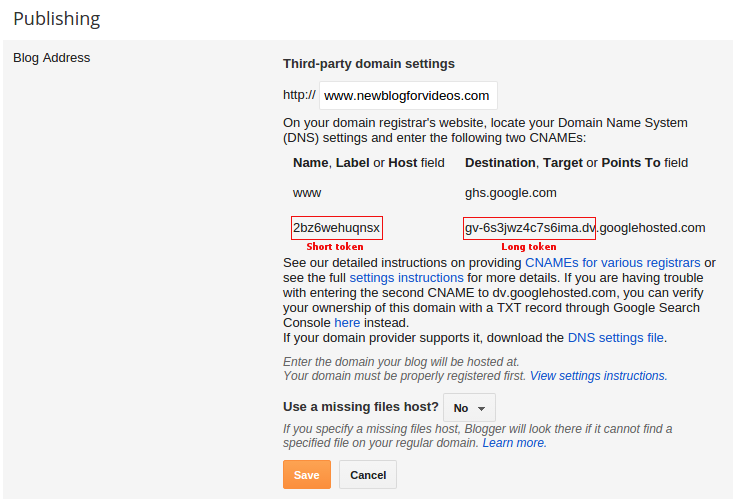 Now, your blog in Blogger has custom domain.